Recently I successfully passed the 70-533 Implementing Microsoft Azure Infrastructure Solutions exam. Note: “Recently” is in reference to January of 2017. Originally this material was shared via a blog post, but I decided to convert it into a page for faster/easier reference within the new Resources > Exam Resources section. I enjoyed this book, and although there were sections that I knew a lot of content from, it helps to review the knowledge either way. 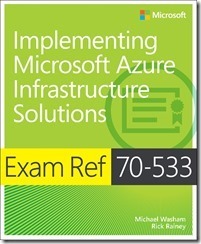 I also posted a book reference with my highlights, which can be found here: http://adinermie.com/resources/technical-book-reviews/book-review-exam-ref-70-533-implementing-microsoft-azure-infrastructure-solutions/. I used the PluralSight course to review material and to increase my knowledge in areas that I was weaker in (i.e. Azure AD). Another useful video course that I found was the Cloud Ranger Free Azure Training (70-533) series. There are 47 videos in this course, so you can either watch the entire series or only view the topics that you may personally need to focus on. I also have a lot of real-world hands-on experience in Azure. This is important, as it helps to solidify your understanding of how the technologies work, and how they go together. As a demonstration of this, I developed my current employer’s (New Signature) Azure Cloud Lab course. Here is an example description of the Azure Cloud Lab course: https://newsignature.com/event/azure-cloudlab-training-mississauga-december-8/. I also developed the Azure Recovery Services version of this Cloud Lab, focused on Azure Site Recovery and Azure Backup. Here’s an example description of this course: https://newsignature.com/event/azure-cloud-lab-azure-recovery-services-focus-mississauga/. The final part of my preparation for the exam was to utilize an official Microsoft Practice Test from MeasureUp. I used this practice test in several ways. First, I took a randomized practice test (not the certification exam mode). Then, I took an individual practice test of all questions for a specific exam objective. Since there are 6 exam objectives, this means I took 6 test. But for each of these, I set the test mode to allow me to view the answers after I had answered the question. That way I could see if I answered incorrectly, and read the explanation to learn and better understand the correct answer. Finally, after using this method for all exam objectives, I took the practice test in Certification Mode.